Brianna the Ballet Fairy (KiteReaders Fairy Series) teaches the lesson of believing in oneself and finding the strength from within to achieve goals. Brianna tries to take shortcuts offered by a mischievous pixie only to discover that sometimes confidence and self-reliance are the best paths to a dream becoming a reality. The illustrations are drawn beautifully but simply (the plums are very clearly plums—which isn’t always so evident just at a glance with picture books) and serves to highlight the theme of the story of a little sprite with big dreams. Children will identify with Brianna in her quest and, I think, easily translate the message to their own lives. 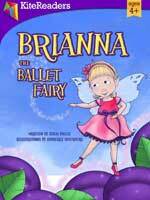 Brianna the Ballet Fairy (KiteReaders Fairy Series) is the perfect gift for a small child or early education teachers and is free in Kindle format on December 19, 2012. Check out further reviews of Julia Dweck’s books My Dog’s Got Fleas, Caarina the Cooking Fairy and Cat or Dog for President.